We love the Apple Watch as much as anyone else, but there are plenty of people out there who don’t want to spend hundreds of dollars or even over $1,000 for a smartwatch. If you count yourself among them, we’ve got a great alternative: the Amazfit Bip Smartwatch by Huami. It’s not just a great Apple Watch alternative, it’s actually better than the Apple Watch in four key ways. 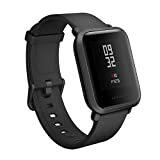 It has sleep tracking, it works with Android devices, it lasts for up to 30 days on a single charge, and it somehow only costs $69.99 thanks to a $10 coupon!